Global payments made easy with savings, control and visibility. 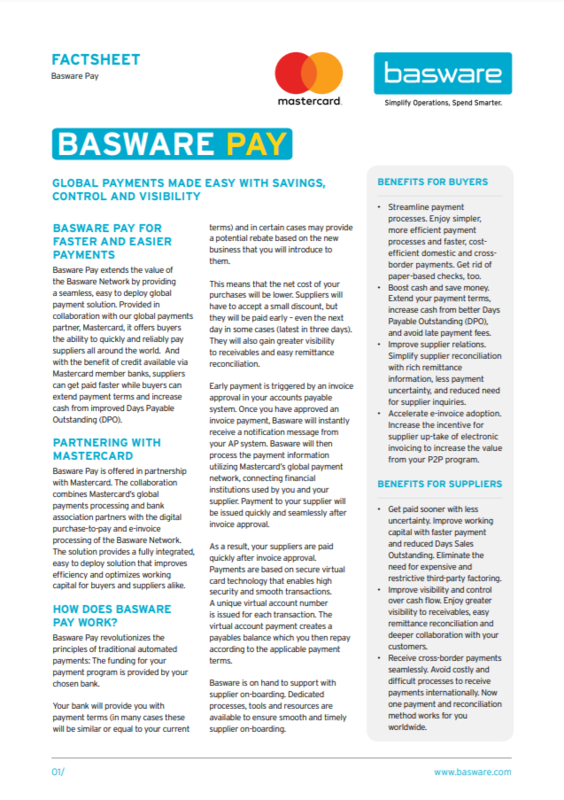 Basware Pay extends the value of the Basware Network by providing a seamless, easy to deploy global payment solution. Provided in collaboration with our global payments partner, Mastercard, it offers buyers the ability to quickly and reliably pay suppliers all around the world. How does Basware Pay work? Basware Pay revolutionizes the principles of traditional automated payments. The funding for your payment program is provided by your chosen bank. Download the factsheet to learn more. Basware is the global leader in providing networked purchase-to-pay solutions, e-invoicing, and innovative financing services. As the largest open business network in the world, Basware provides scale and reach for organizations of all sizes, enabling them to grow their business and unlock value across their operations by simplifying and streamlining financial processes.